The Broad-winged Hawk has become a regular sight here at Dyken Pond. Listen for his piercing, high-pitched whistle and then search the sky to see him soaring across an open field to a neighboring canopy. 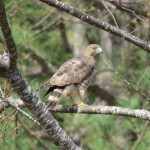 Our resident hawk can be seen perched on the forest edge alongside our main field near the park office.